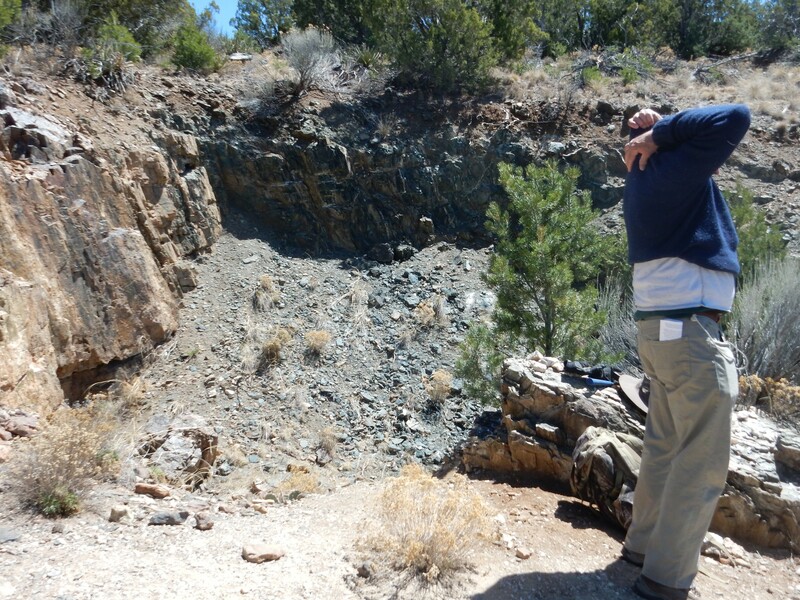 Saturday the Los Alamos Geological Society held a field trip to the Harding mine near Dixon, New Mexico. What follows is a lengthy introduction to the mineralogy of the Harding mine. Bear with me. 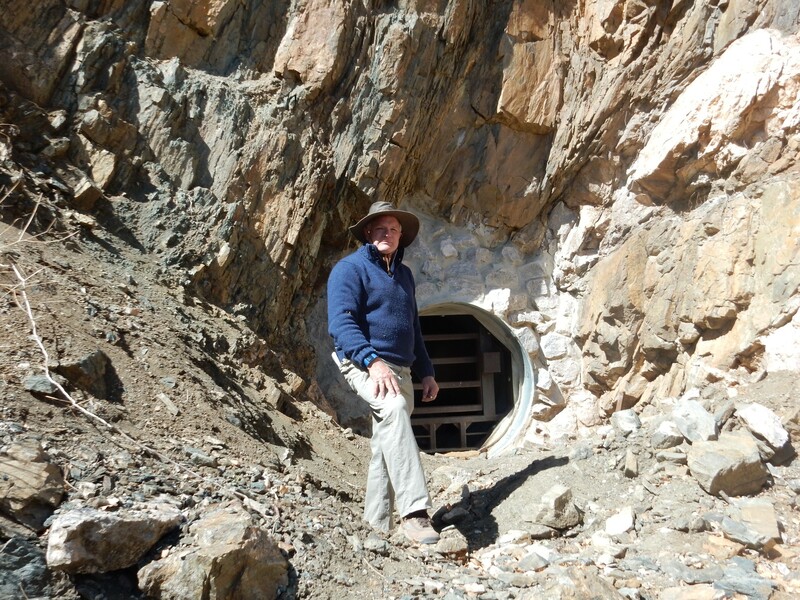 The Harding mine exploits a pegmatite body rich in unusual minerals containing rare elements. This body was formed around 1.3 billion years ago, when a deeply buried pluton, or body of magma, had almost completely solidified. The residual liquid magma was rich in volatiles, such as water vapor. It was also enriched in incompatible elements. Magnesium and iron are both common elements. Manganese, which is somewhat less common, can form a +2 ion that is so similar to iron that it is easily incorporated in iron and magnesium minerals as a minor component. For this reason, distinctive manganese minerals are fairly uncommon even though manganese is a moderately abundant element in the Earth’s crust. Such elements are described as compatible elements, and they easily crystallize out of a magma as impurities in common minerals of more abundant elements. Incompatible elements have an unusual combination of charge and radius that is unlike any of the common elements. For example, lithium ions have a charge of +1, but are much smaller than sodium or potassium ions, which also have a charge of +1 and are otherwise chemically similar. This makes lithium an incompatible element. It cannot easily enter the structure of the feldspars and micas that are the most common minerals of sodium or potassium. This means that as a magma cools and solidifies, the lithium tends to remain in the liquid magma and can become highly concentrated. Other incompatible elements include boron, beryllium, rare earths, tantalum, and fluorine. In a sense, water acts like an incompatible element, which is why it is highly concentrated in residual magmas. The residual magma from a nearly solidified pluton, being highly enriched in volatiles, is lower in density than normal magma or the surrounding country rock. This means that buoyant forces will drive the magma away from its parent body towards the surface, carrying with it a rich supply of incompatible elements. 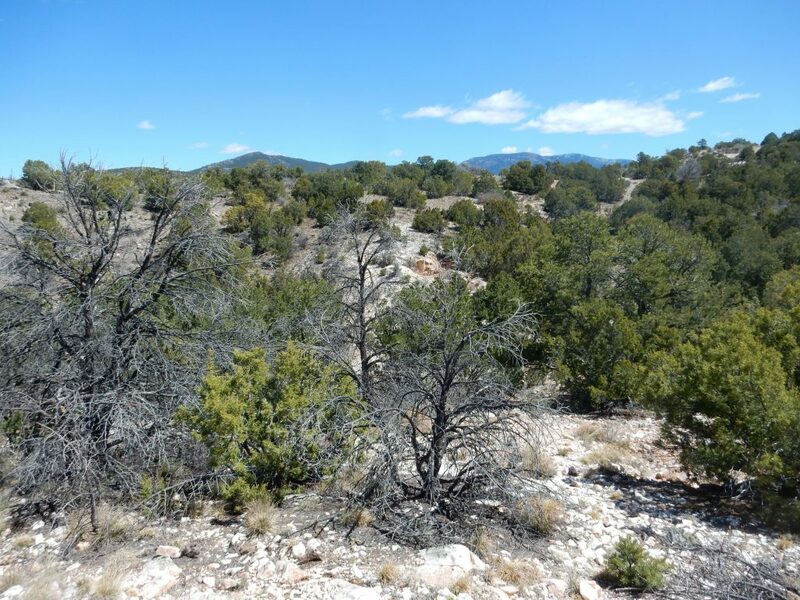 However, the residual magma rarely makes it to the surface. Instead, it comes to rest and finishes solidifying somewhere in the upper crust, typically a few kilometers deep. The surrounding country rock is an excellent insulator, and, together with the high volatile content of the magma, gives the pegmatite its other characteristic feature. The high volatile content greatly reduces the viscosity of the magma, allowing ions to move freely through the melt. Combined with very slow cooling, this allows very large crystals to form in the solidifying magma. 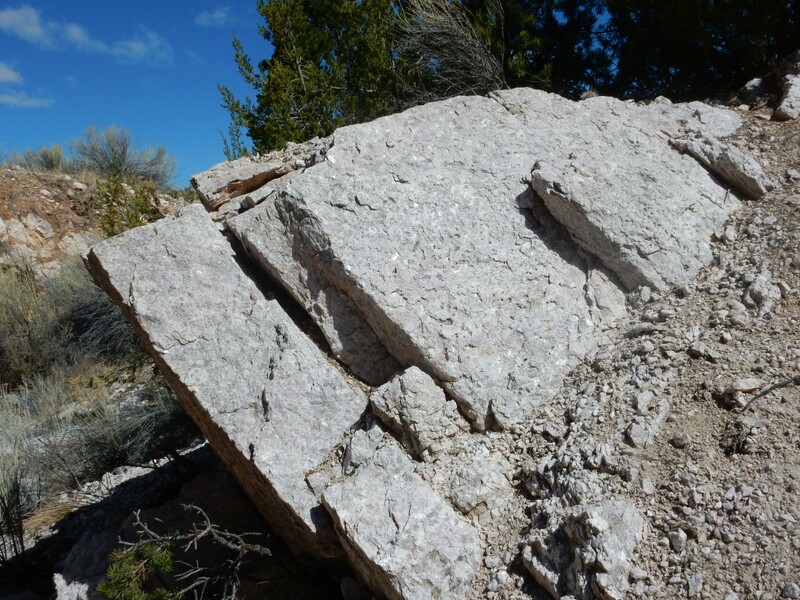 Thus, pegmatites are defined by the presence of very large crystals. Curiously, not all pegmatites are enriched in rare elements. Those that are composed of very large crystals, but only of common minerals such as quartz, feldspar, or muscovite mica, are known as simple pegmatites. They are little more than curiosities, though simple pegmatites were once extensively mined for their mica. Those pegmatites that contain minerals of rare elements are known as complex pegmatites, and these are of great interest to prospector and miners. 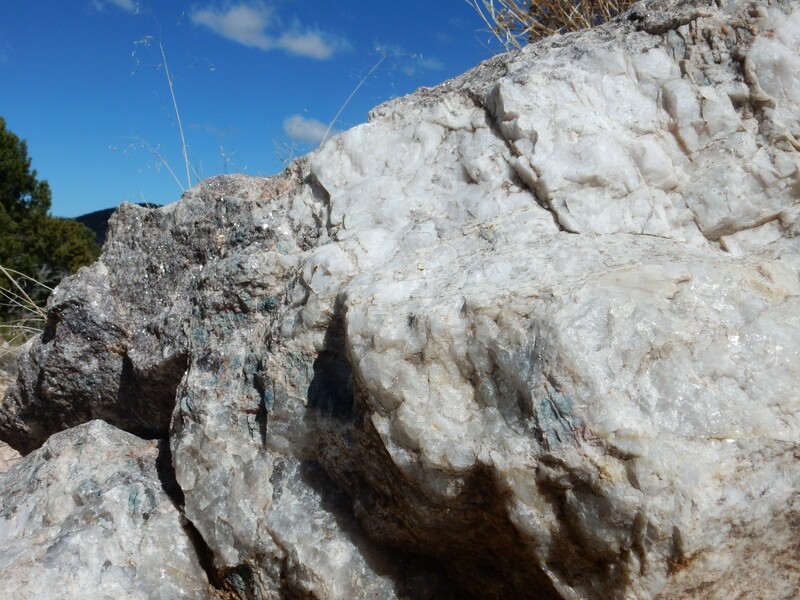 Some complex pegmatites, such as the pegmatite at the Harding mine, contain more than fifty distinct kinds of minerals. The Harding mine was originally mined for lithium, which was used in Pyrex glassware. 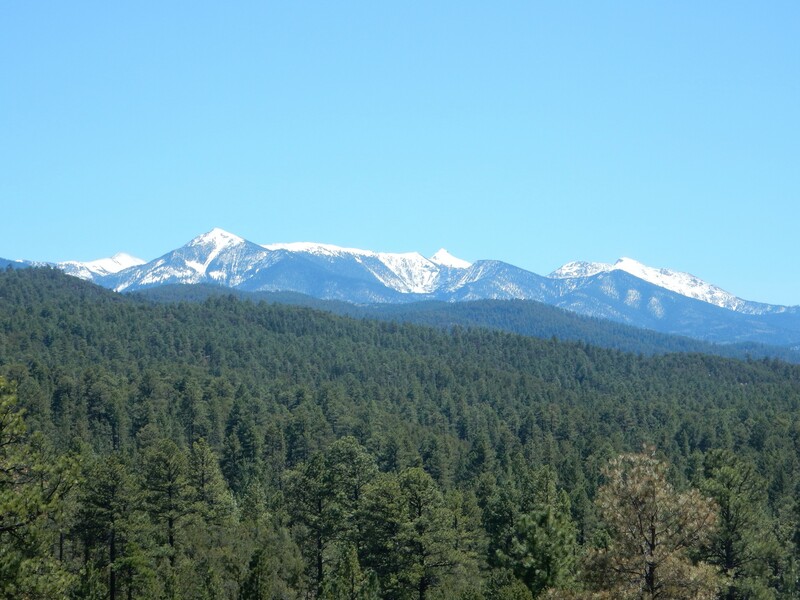 Some of the minerals found at the mine contain upwards of 6% lithium oxide, which is vastly enriched over the average value in the earth’s crust (less than 70 parts per million.) This did not long remain profitable and the mine closed in 1930. However, during the Second World War, the mine was prospected again and found to have significant amounts of tantalum, a metal used to produce steel alloys that are highly resistant to corrosion. Mining resumed in 1942, and, for a time, the Harding mine supplied most of the free world’s tantalum. Production shifted to beryllium in 1950, but mining ceased for good in 1958, and the mine was later donated to the University of New Mexico for its educational value. 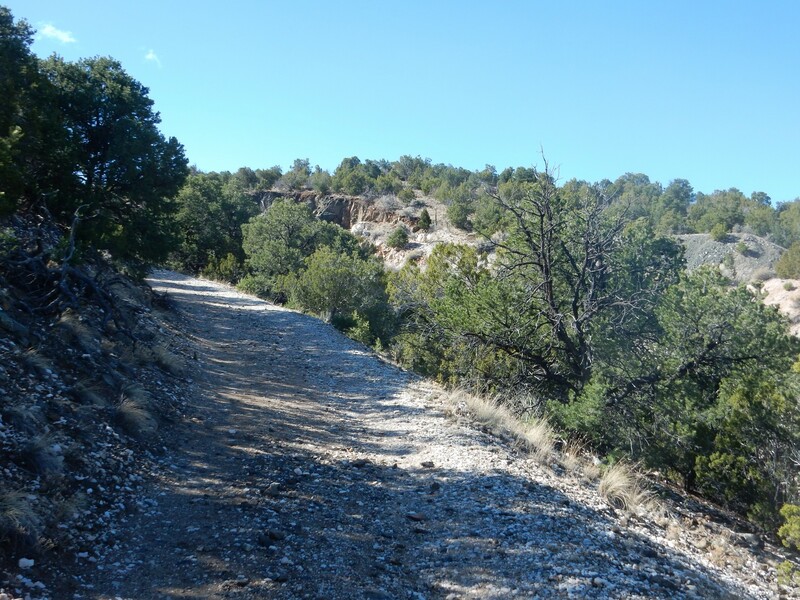 The mine now has signage and numbered stations for a walking tour; visits must be arranged in advance through UNM. 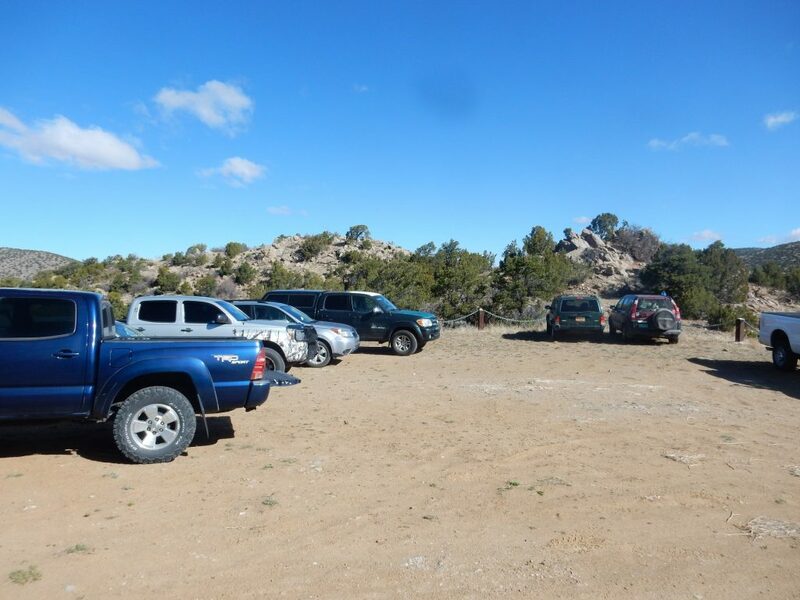 Our group assembled at the start of the entrance road and got briefed, then many of the cars drove in to the first gate (where some of our cars parked) and on to the second gate where the rest of us parked. 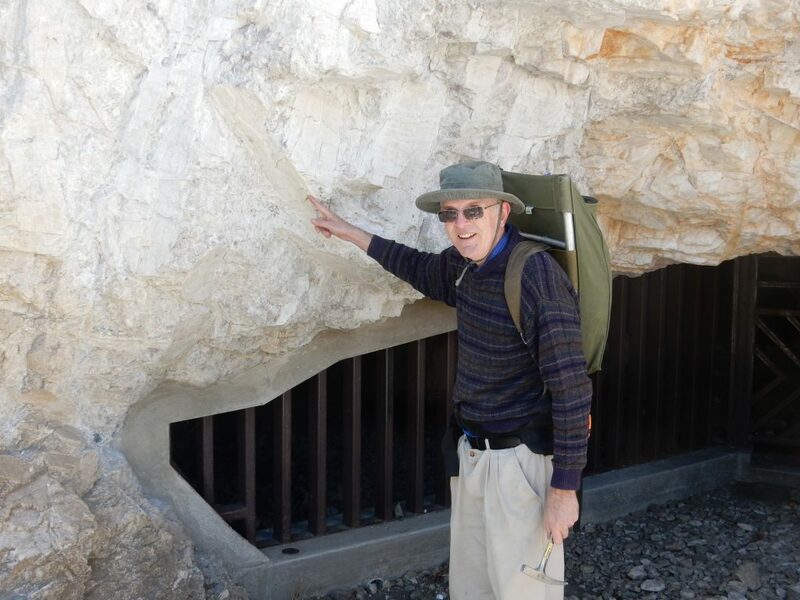 One of our guides showed samples of minerals from the mine, so that we would know what to look for, and Gary Stradling and I headed for the mine area itself. We were told that we should limit ourselves to about five pounds of specimens; I expected I would pick up more than that, then sort out the best five pounds. It seems to be the usual pattern. The mine is just coming into view here. The road passes onto part of the tailings, and we decided to climb down the slope from the road and collect our first specimens. 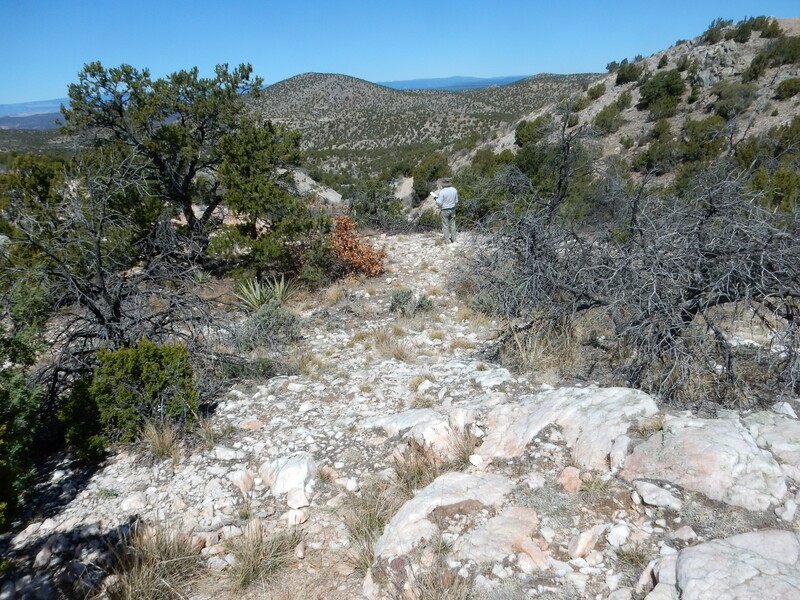 This area was rich with feldspar, quartz, and various micas. We picked up our first samples of lepidolite and rose muscovite. Most of the white, translucent material is quarts, which is abundant throughout the pematite. 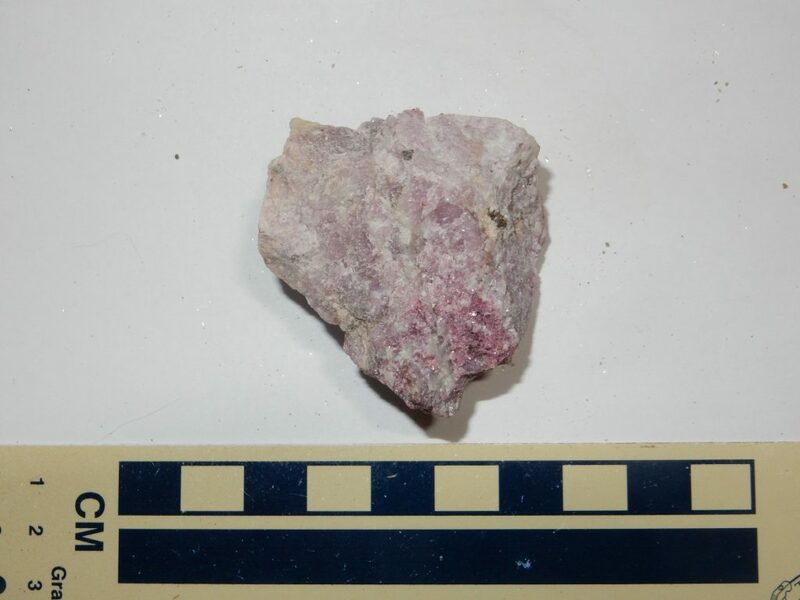 The flaky mineral with a reddish coloration is either rose muscovite or lepidolite. It turns out that distinguishing rose muscovite from lepidolite is actually pretty hard. They are both mica minerals, sharing the same basic mineral structure, and they both get their ruddy color from manganese contaminants. However, lepidolite substitutes lithium for aluminum in certain crystal sites; because aluminum is a +3 ion and lithium is only a +1 ion, this requires substituting silicon for aluminum in a different set of sites to restore charge balance. One web page I consulted said that it’s basically not possible to reliably tell the two apart short of chemical analysis in a laboratory. 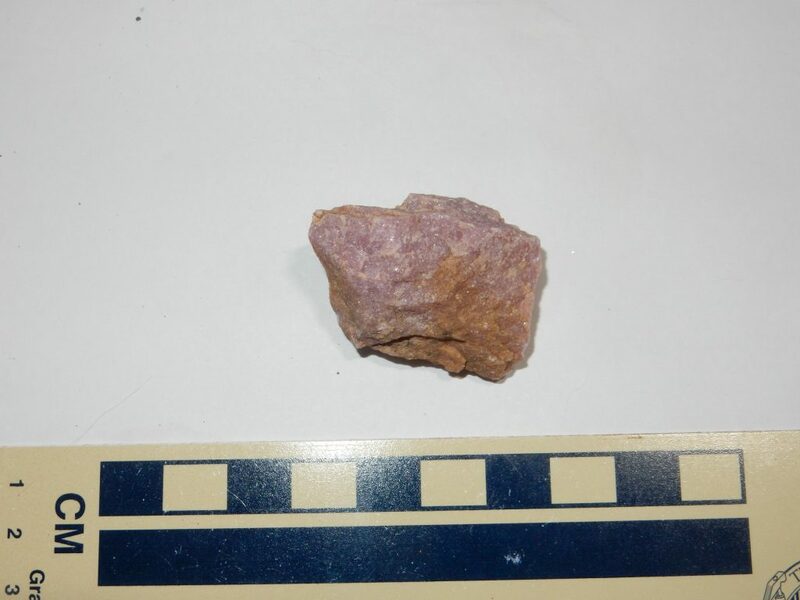 However, some of the experienced hands on this Harding trip believed that the lepidolite tended to be more purple than red and to rarely show discernible individual flakes. That makes both the preceding samples rose muscovite. which are such common minerals that I wonder why I bothered to pick any up, especially with a 5-pound bag limit. 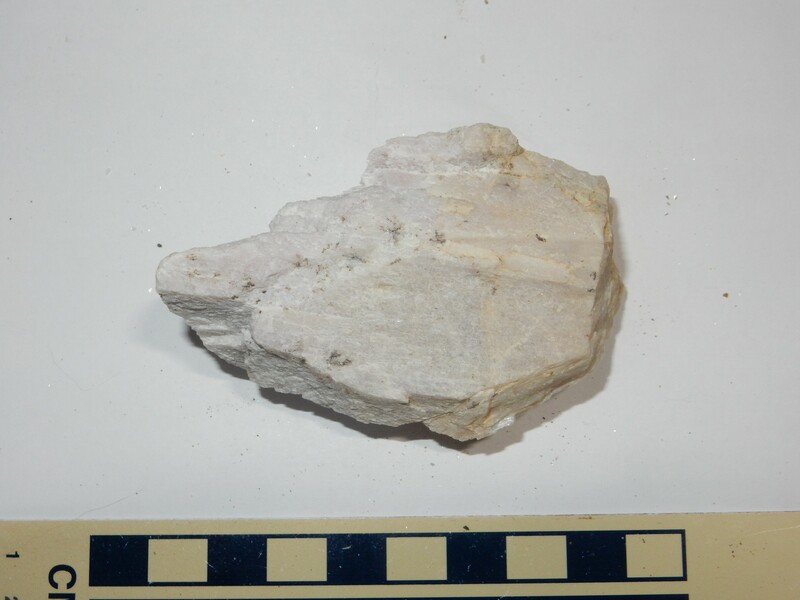 Still, they make up a large fraction of the pegmatite, and so are the most important “gangue” minerals, minerals in a mined ore deposit that are not themselves valuable and must be separated from the ore.
Quartz is more or less pure silicon dioxide, in the form that is most stable at room temperature. It is also the hardest common mineral, but not the hardest mineral in the Harding pegmatite — that honor probably goes to beryl, which is an uncommon mineral that was one of the principal ores of the mine. Feldspar is from the same family of silicate minerals (tektosilicates) as quartz, but contains aluminum and either sodium, potassium, or calcium as part of its mineral structure in addition to silicon and oxygen. 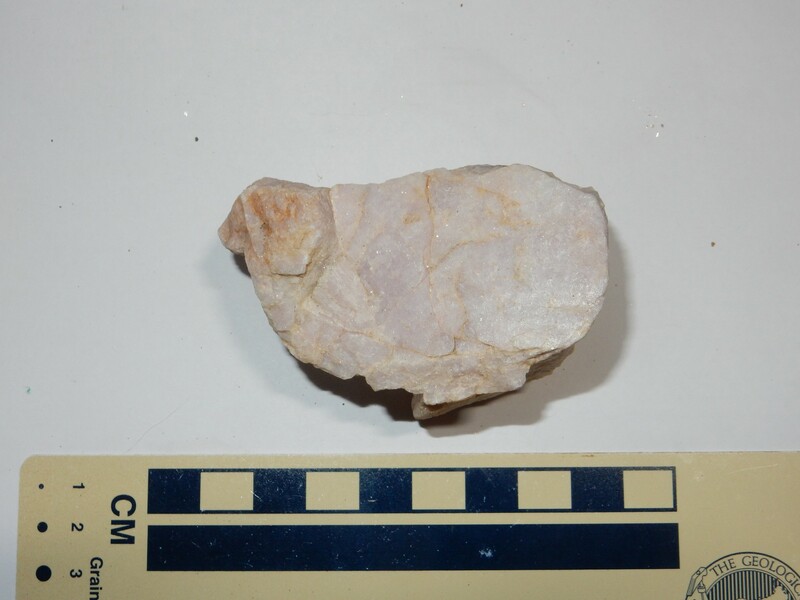 The feldspar at the Harding mine contains very little calcium, which tends to solidify out of a magma early on, so most of the feldspar is either albite (sodium feldspar) or microcline (potassium feldspar). 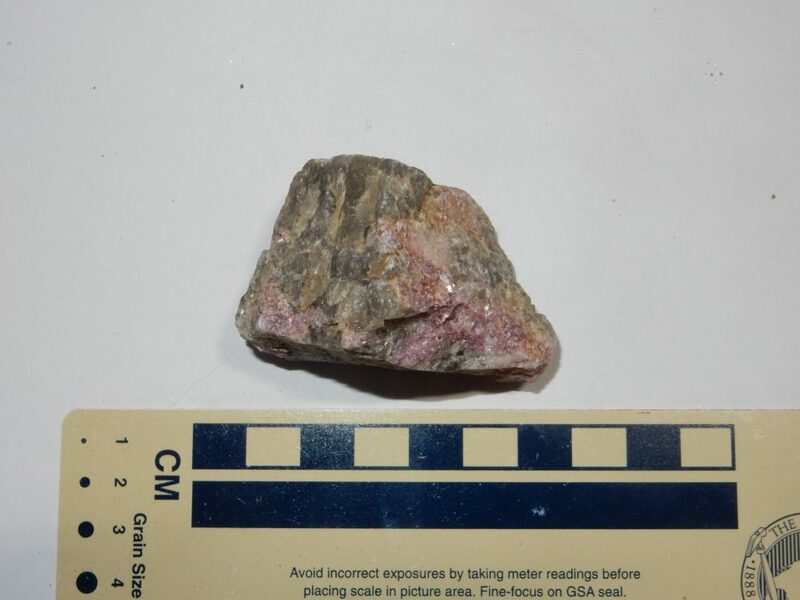 The sample I’ve just shown is probably microcline, judging from its faint salmon color. Albite tends to be pure white. This is a nest of long needlelike crystals of tourmaline. Tourmaline is perhaps the most widely distributed boron mineral, though not an important commercial source of boron; most commercial boron comes from deposits of borax in a very few desert locations. Tourmaline has a highly variable composition, but most is schorl, sodium iron tourmaline, of which this is an example. 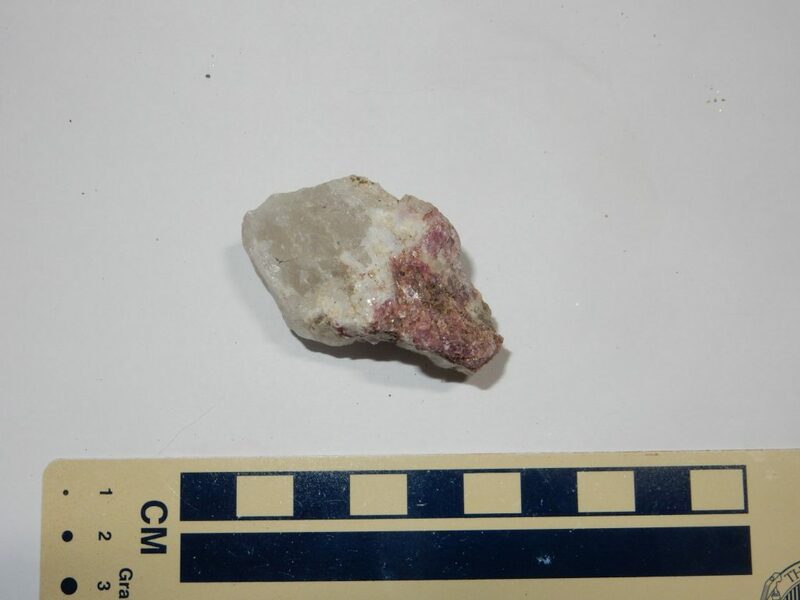 There is also a light-colored lithium tourmaline, which I would expect to find at a place like the Harding mine, but I’ve heard of none here. The tourmaline in the photograph is not from the pegmatite itself. 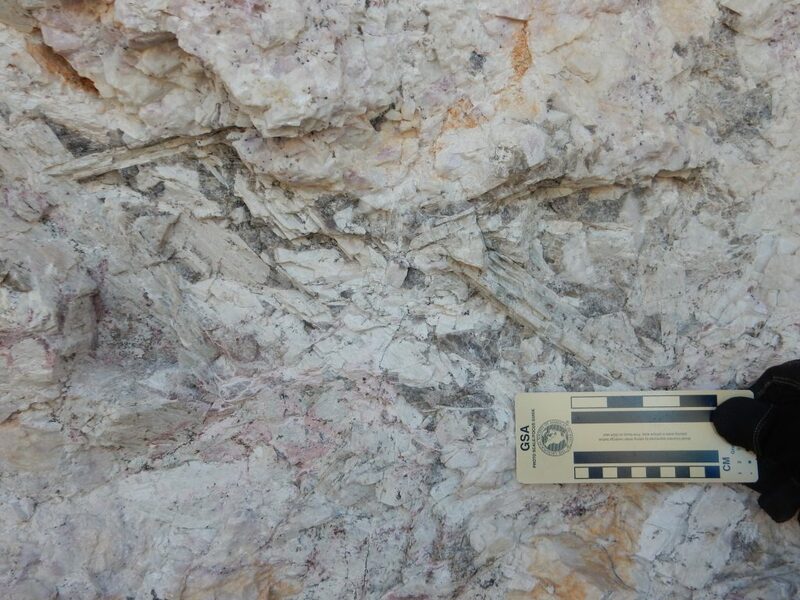 The pegmatite lies along the boundary between amphibolite beds above and to the south and and quartz-muscovite schist beds below and to the north. Both are around 1.7 billion years old, much older than the pegmatite, and the boundary was apparently a weak zone into which the pegmatite magma was able to intrude. The amphibolite is a very dark rock containing ample hornblende, a very common iron-rich mineral, and it likely formed by metamorphosis of basalt. The schist is a light-colored rock rich in quartz, feldspar, and mica, not much different in composition from ordinary granite, and likely formed from metamorphosis of sediment beds. 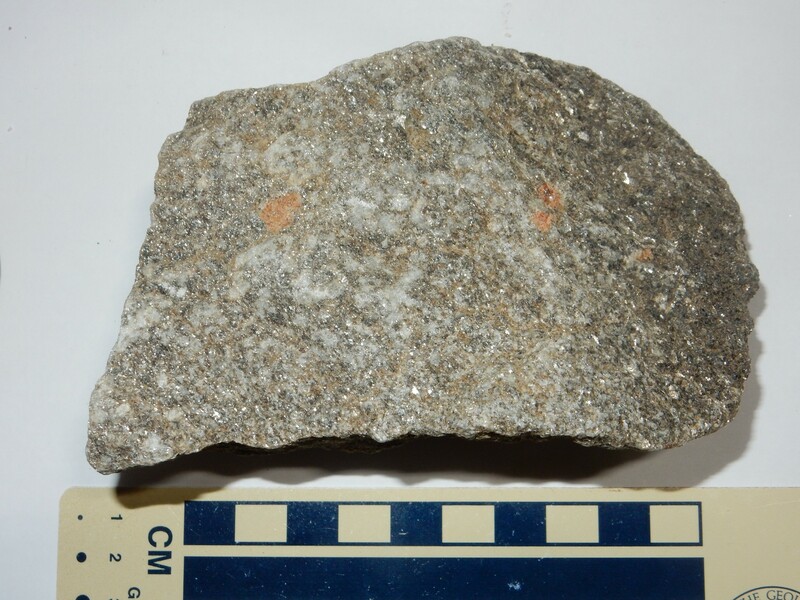 The amphibolite close to the magma was intruded by hot fluids rich in boron and sodium, a process called metasomatism, and the boron and sodium combined with some of the iron and silicon in the amphibolite to form tourmaline. Although the individual tourmaline crystals are not large (I have some larger ones in my collection from the Joseph Mine north of Ojo Caliente) they form a spectacular nest of crystals. Atop the tailings pile, we found ourselves near the west end of the main mine workings, below the adits (horizontal mine tunnels), in the upper part of the pegmatite. 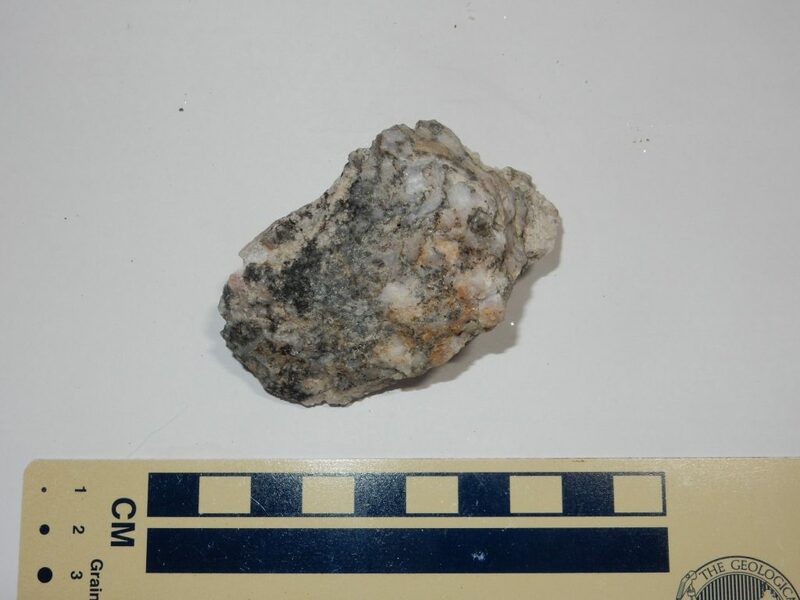 Because the pegmatite cooled and crystallized so slowly, it is a zoned pegmatite, with certain minerals found right at the contact with the surrounding rock, a layer with slightly different composition away from the contact, and yet other layers deeper in the pegmatite. We were in the upper beryl zone, which is the first layer inside the contact “rind”. 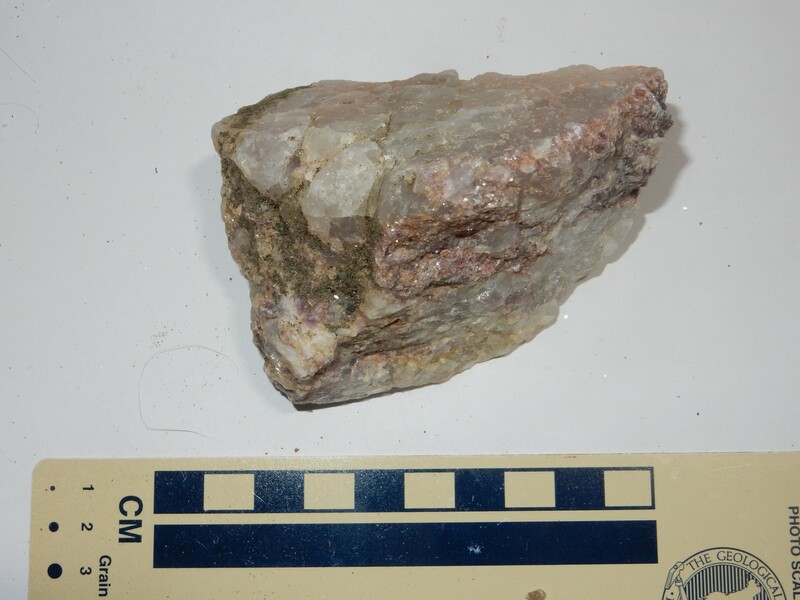 This is actually mostly quartz, muscovite mica, and albite feldspar, but some parts of this layer had huge crystals of beryl and the west adits were excavated to exploit these. This outcrop is mostly quartz (the white irregular rock) but with a mess of muscovite, potassium mica, at upper left. 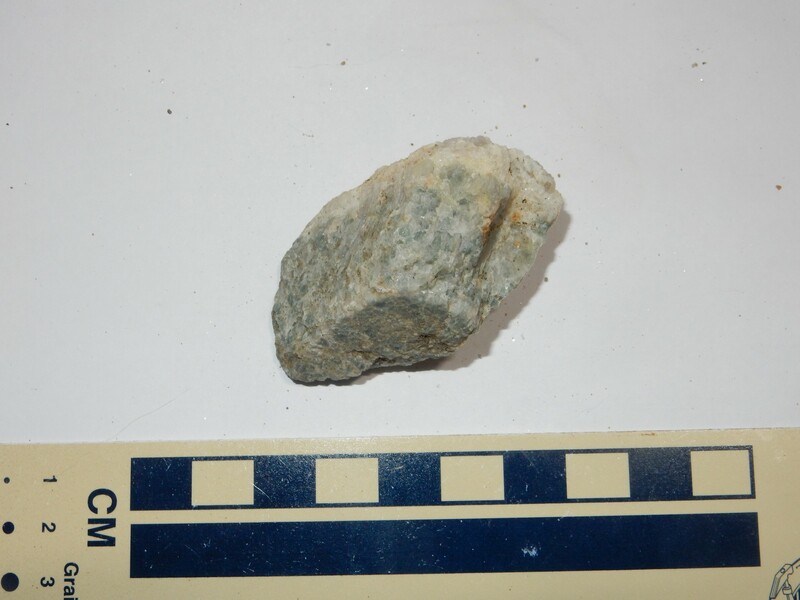 There are also blue-green spots of apatite, a calcium phosphate mineral. Notice that the quartz is darker around the muscovite and apatite. This may be due to very low-level radioactivity from potassium in the muscovite and uranium in the apatite; the radioactivity has had 1.3 billion years to work over the quartz and darken it, so even very low levels could have an effect. I was anxious to bring home some beryl from this trip, but it turns out the stuff is not all that easy to distinguish from quartz. It’s harder, it sometimes shows a basal cleavage (feldspar shows very distinct cleavage while quartz shows no cleavage) and it has a subtly different luster, described as greasy or resinous. I thought the rock at the top of this outcrop was subtly different from the masses of quartz below and spent some time hammering off a piece, but when I showed it to more experienced club members later on, they thought it was quartz. Shucks. At least I got some of the apatite. The green color is fairy typical for apatite. 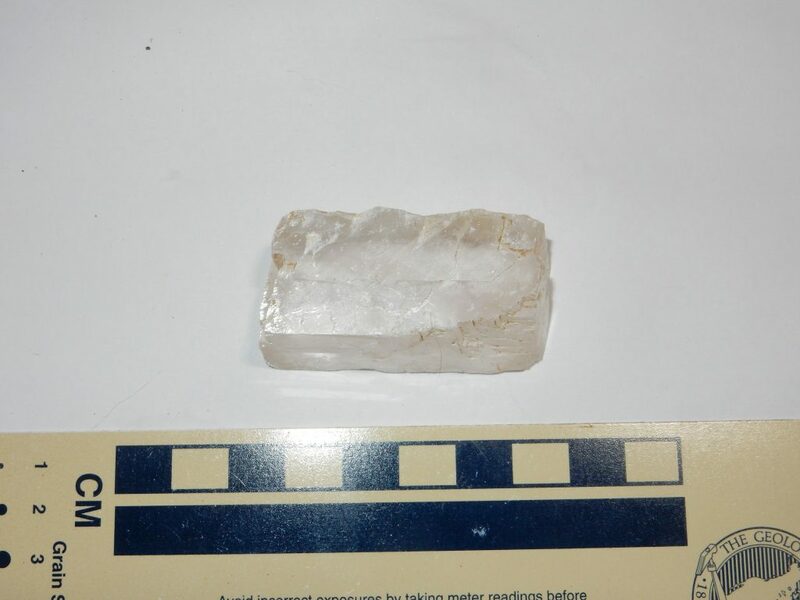 Apatite can form with either hydroxyl, chloride, or fluoride ions at one set of sites in the crystal; the apatite at Harding Mine is likely fluoroapatite. This at least is geologically interesting. 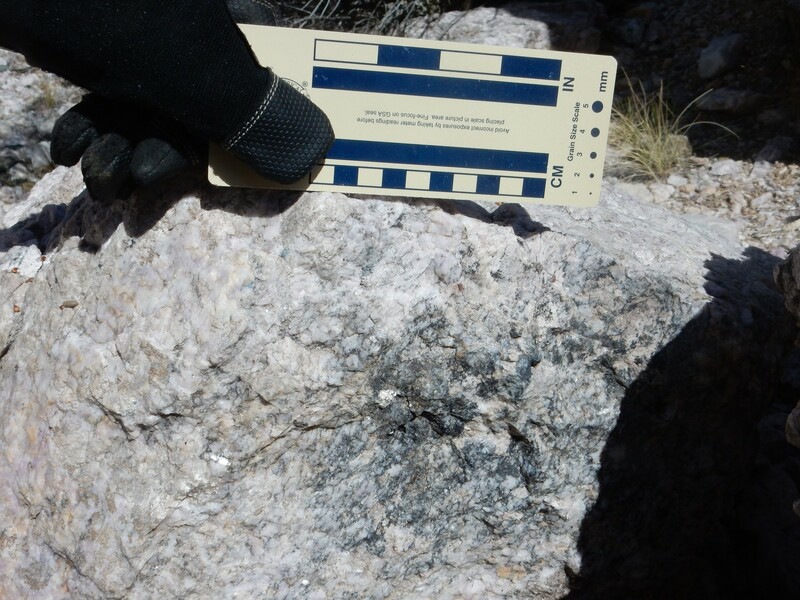 This boulder preserves part of the contact of the pegmatite with the overlying very dark amphibolite. You can see a very definite chilled margin where the pegmatite cooled relatively quickly in contact with the amphibolite to produce fairly fine-grained rock. 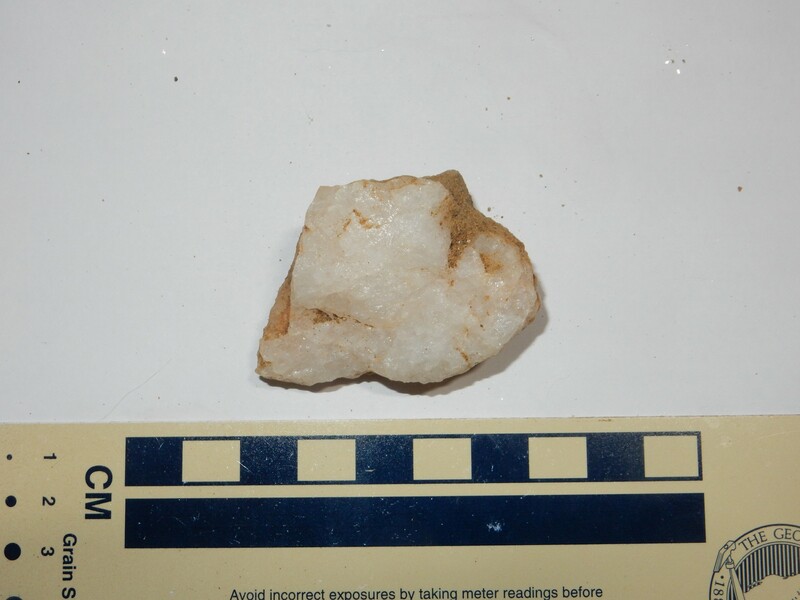 This is likely mostly quartz and feldspar. Gary at one of the adit mouths. This adit likely was looking for beryl, since it is very near the upper contact of the pegmatite. The main dike had a number of smaller dikes branch off from it; you an see one at upper right, with dark amphibolite above and below. 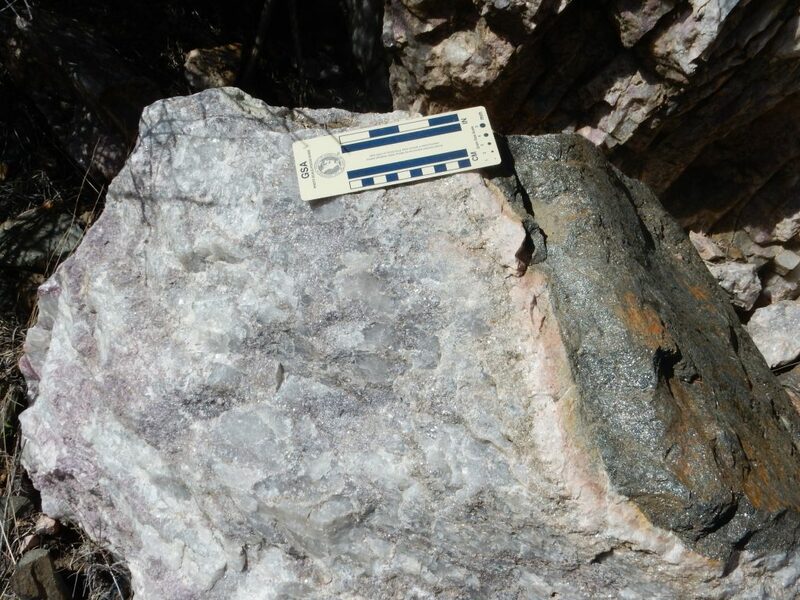 The central zone of the pegmatite, which cooled last, is composed of “spotted rock”. and worked rather hard with the hammer to get a piece. The mine caretaker later showed me a real piece of tantalite, from placer deposits below the mine. I had to agree that it looked nothing like this. 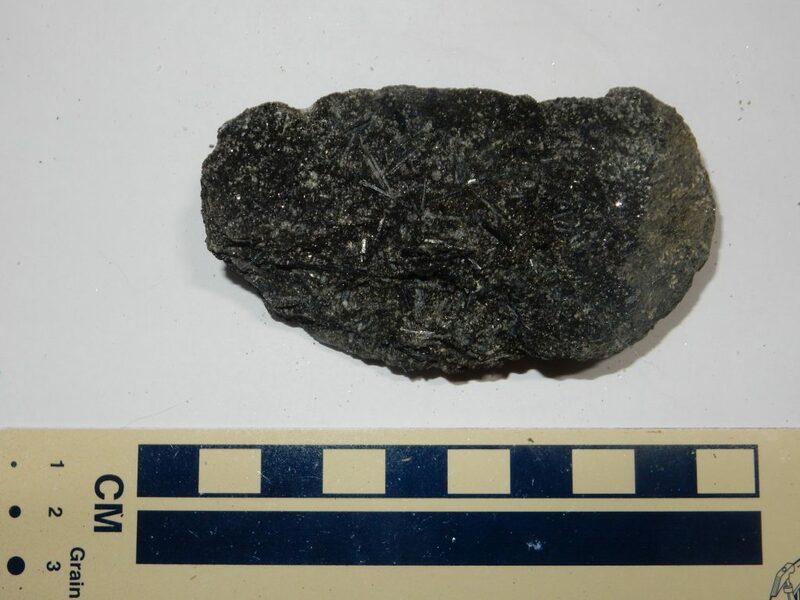 My second guess, after tantalite was ruled out, was that this was pyrolusite, a fairly common manganese mineral that often forms dark films and dendrites. 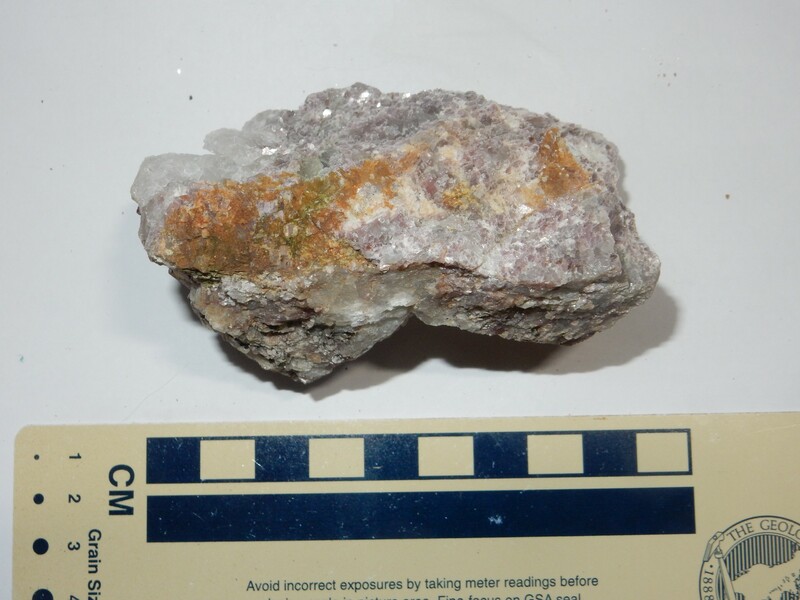 However, the MINDAT Web site insists that reports of pyrolusite at the Harding mine are in error, and my third guess is that this is native bismuth, which MINDAT lists as a mineral found here. We wandered east into the spodumene zone, which lies between the beryl zone and the spotted rock. The large criss-crossing lathes are crystals of spodumene, a lithium pyroxene mineral that was one of the richest lithium ores mined here. Some of the crystals are enormous. Spodume seems to weather readily, and there are numerous casts of spodumene laths, since eroded away, in the surrounding quartz. What appears to be a crystal face here is the cast of a spodume crystal, now missing, on a quartz surface. You can see surviving remnants of the spodumene at the top of the photograph. As I pointed out to Gary, the really good stuff was probably removed by the miners. We’re seeing the leavings. Not all the spodume has weathered, and we got some nice specimens. The general appearance make it fairly easy to distinguish spodumene from feldspar and quartz. This zone also has lovely purple outcrops of lepidolite. as rose muscovite. Gary and I put considerable time into hammering loose some good specimens of both. We explored the eastern workings, which seemed devoid of really interesting specimens, then climbed the knoll east of the mine workings. Here I took a panorama. 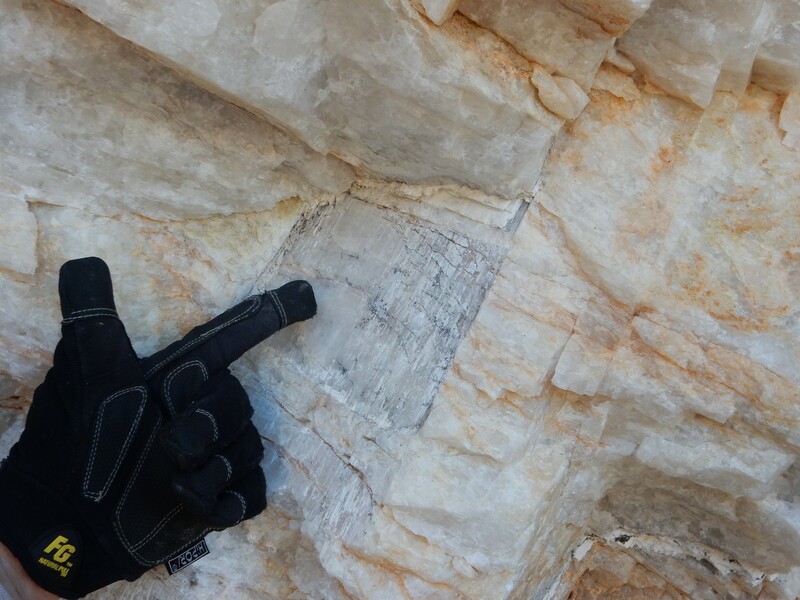 This is how the pegmatite exposure looked when it was first discovered. Similar outcroppings extend some distance east along the contact between the amphibolite and the mica schist. It looks like the pegmatite here was worked a little and then abandoned. We thought about hiking over and checking it out, but concluded that, if it had been abandoned, it must not be very interesting. 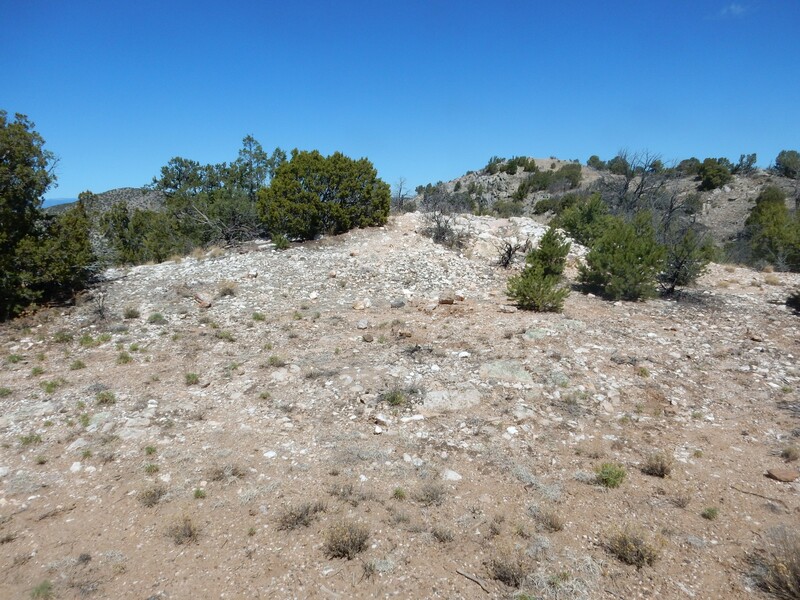 The quartz knoll had a couple of what looked like very old prospecting pits in it. We picked one that had some shade and ate some lunch. After lunch, we wandered back through the “spotted rock”, then south of the main workings to the Iceberg Mine. We wandered back to the main workings and found that we were nearly alone. The mine is gated; we needed to be out before the gate was locked. We headed back to the parking area and I let Patrick Rowe look over my specimens. Alas, none of my “beryl” was actually beryl; but, on the plus side, some of my specimens actually had microlite that I had not noticed. The microlite is the yellowish-brown patches. We had a fair number of specimens. Patrick was concerned we’d gone over the bag limit; I started tossing inferior specimens, and he stopped me and had me head back to the mine to leave them there rather than in the parking area. I mean well but still have something to learn about rockhounding ettiquette. Some other specimens I picked up I’m not sure where in the mine. 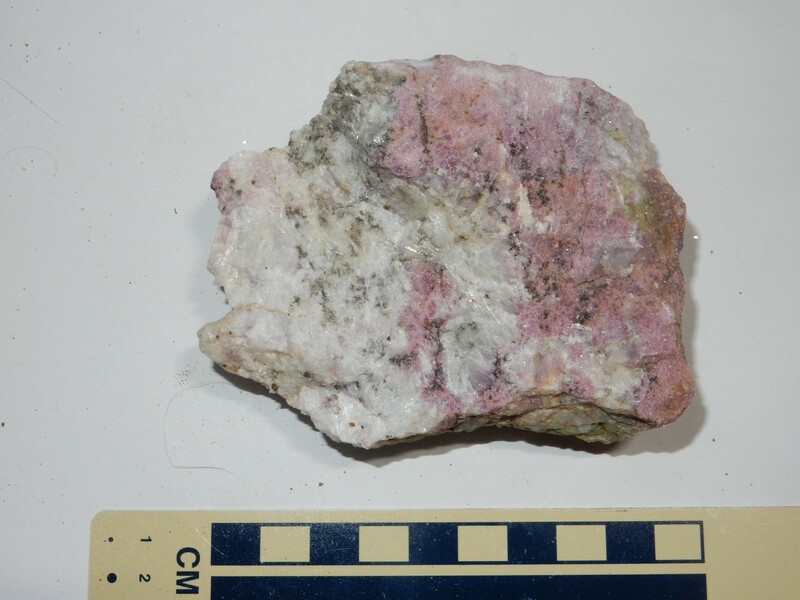 Mica-rich rock containing a few pink spessartine garnets. I’m not sure. Smoky quartz? But it seems to show cleavage. 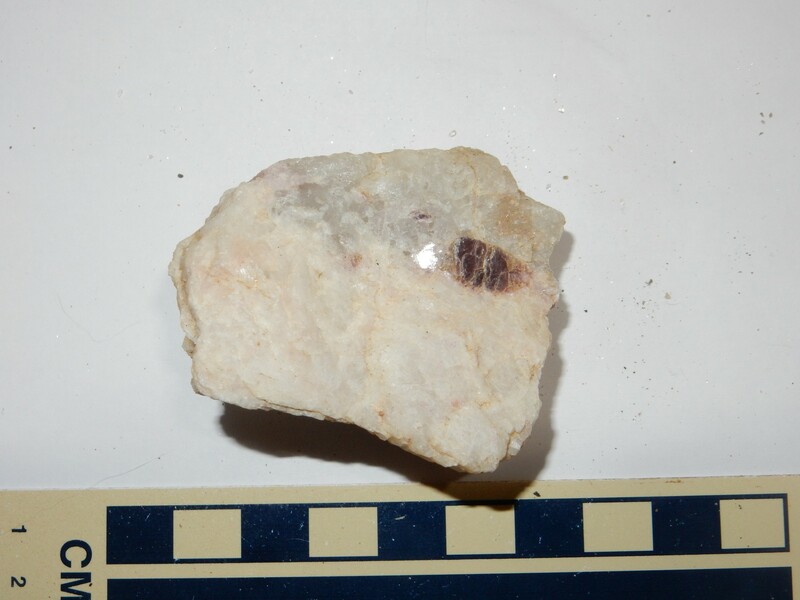 A nice single “book” of rose muscovite. We got home. I gathered up my specimens, stepped on the bathroom scale, and got a weight of 175.0 pounds. Took the specimens downstairs to my man-cave, came back, and weighed myself again. 170.0 pounds. Exactly five pounds of specimens. I was frustrated to have not gotten any beryl. And while I got some nice specimens of other stuff, there was nothing really spectacular. The mine has been picked over pretty good by decades of visitors. Still. I got out the UV lamp on a whim and started checking out specimens. The spodumene turns out to have a slight pinkish glow. Some of the rose muscovite also shows a hint of a red glow. 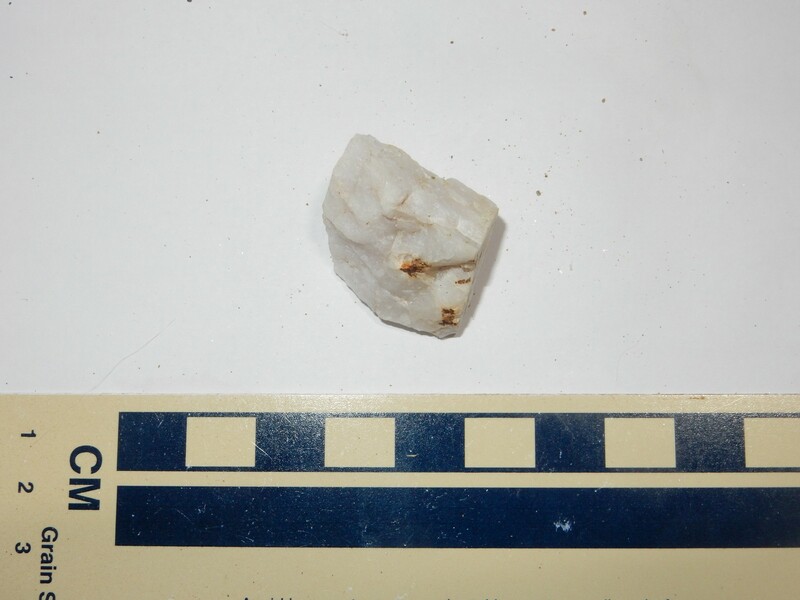 A couple of specimens had spots of a white, fine-grained mineral, unremarkable under room light, that glowed brightly white under UV. But the most spectacular was the apatite; it glowed a bright yellow. 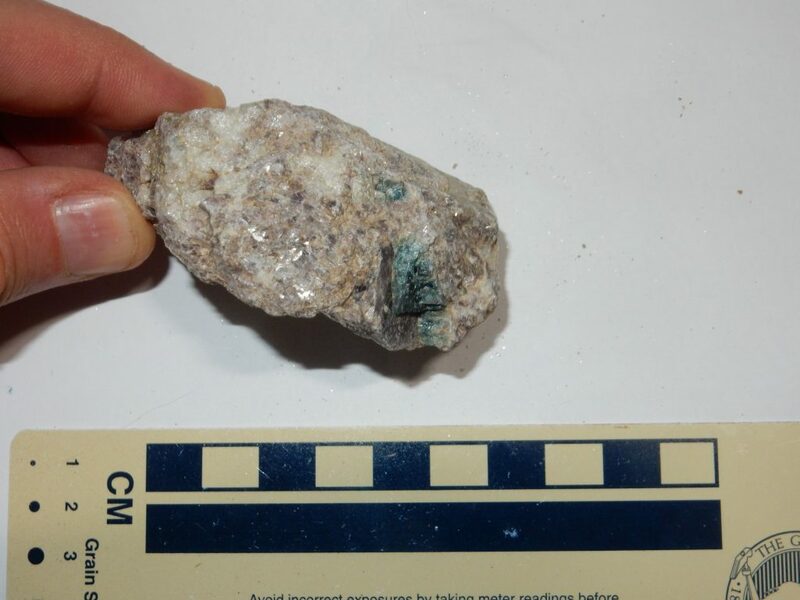 Not the obvious dark green crystals; the more transparent and less colored apatite gave the best glow. Self-absorption in the darker stuff, I imagine. Still wish I had gotten some beryl.